More than 1000 people who describe themselves as ethnic Chinese demonstrated in Melbourne this morning, sending a message to the Australian government not “to be used as a pawn of America’s hegemony strategy”. The crowd marched through the city’s CBD over the recent determination of a UN tribunal that found in favour of the Philippines against China over its conduct in the South China Sea. AT RIGHT: The Chinese and the Australian flags flying together at this morning’s demonstration. And while the placards this morning extolled “justice, truth and peace” there were unmistakable hints that things could get nasty, with statements that the Philippines had “unilaterally abandoned the means of solving this dispute through negotiation,” that this is “causing warships to gather there [fore]shadowing likely wars” and that “for the strategic purpose of containing the rise of China, Japan and the US have manipulated certain countries and created a series of incidents impeding the peaceful resolution”. Alice Springs may well be 2255 km from Melbourne, but Darwin port, now Chinese-owned for 99 years, is a lot closer than that, and Pine Gap – undergoing a rebirth as a suspected nuclear target – is just 19 km away. This morning protesters’ thoughts were not far from armed conflict, and Territorians, who now have ‘skin in the game’ thanks to the Darwin port decision, should be aware of the tensions currently building. “For many Australians it doesn’t require an excellent memory to recollect the wrong Iraqi war in which millions of lives perished not so long ago,” said a pamphlet handed out by the protesters – almost all well-dressed, with a middle-class to affluent appearance, conducting the protest with gusto but nonetheless orderly. 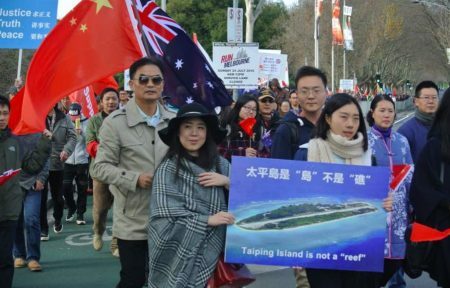 And to dispel any suspicions that this was an insignificant minority in the streets of Melbourne, a Chinese website supported the sentiments expressed with a statement signed by 169 Chinese organisations and 15 media outlets, all located in Australia. The Chinese are claiming that the Philippines are acting contrary to the 2002 Declaration on the Conduct of Parties in the South China Sea, adopted by the Foreign Ministers of ASEAN and the People’s Republic of China and signed by the Philippines. “The parties reaffirm their commitment to the purposes and principles of the Charter of the United Nations, and the 1982 UN Convention on the Law of the Sea,” says the declaration. But the Philippines say they called in the UN because – amidst “continuing intrusions by China” – they weren’t getting anywhere: “Despite more than seventeen years of consultations, no progress has been made to achieve negotiated solutions,” says its embassy. China was claiming “indisputable sovereignty” over the South China Sea, including the West Philippine Sea and it had “become impossible to continue bilateral discussions,” say the Philippines. The tribunal, constituted under the United Nations Convention on the Law of the Sea, concluded that there was no legal basis for China to claim historic rights to resources in excess of the rights provided for by the Convention, within the sea areas falling within the “nine-dash line”. That is the demarcation line used initially by the government of the Republic of China (ROC and Taiwan) and subsequently also by the government of the People’s Republic of China (PRC), for their claims of the major part of the South China Sea. Says the tribunal about the partly artificial islands constructed by China: “Features that are submerged at high tide generate no entitlement to maritime zones. “The Tribunal noted that many of the reefs in the South China Sea have been heavily modified by recent land reclamation and construction and recalled that the Convention classifies features on the basis of their natural condition. “But rocks which cannot sustain human habitation or economic life of their own shall have no exclusive economic zone or continental shelf. “Temporary use of the features by fishermen did not amount to inhabitation by a stable community and that all of the historical economic activity had been extractive in nature. “Accordingly, the Tribunal concluded that all of the high-tide features in the Spratly Islands are legally ‘rocks’ that do not generate an exclusive economic zone or continental shelf. “The Tribunal considered the lawfulness of the conduct of Chinese law enforcement vessels at Scarborough Shoal on two occasions in April and May 2012 when Chinese vessels had sought to physically obstruct Philippine vessels from approaching or gaining entrance to the Shoal. “The Tribunal found that Chinese law enforcement vessels had repeatedly approached the Philippine vessels at high speed and sought to cross ahead of them at close distances, creating serious risk of collision and danger to Philippine ships and personnel. While the tribunal’s decision is “binding,” even though China did not participate in the process, it is widely assumed not to be enforceable. Just room for thought – if we have a conflict with China, how is China controlling Darwin harbor going to go? True, but they are a lot closer to China than they are to the US, and they are the ones stirring this pot. And what’s the proof the Chinese own the islands? A lot closer to other countries than China itself. These islands belong to China, for thousands of years. If there was no oil or gas there America would not worry about them. It’s time America realized that they are no longer the super power, countries like India, Russia and China are super powers. It’s time Australia distancad ourselves from America. Everywhere America goes causes war and misery, even in Alice Springs people are talking about what would be the consequences if an atomic bomb dropping on Pine Gap. To understand the current conflict in the South China Sea, it is necessary to place it in a global context. Following the collapse of the Soviet Union and the end of the Cold War almost 30 years ago, the US has positioned itself as the world’s sole superpower and indispensable nation. To achieve this end, they have used their formidable economic and military might to ensure that what they want, they get. To this end they have destroyed Ukraine, Libya, Syria, Iraq and Afghanistan. I’ll leave the rest of Africa out of it for now, but Turkey is teetering. The blowback is causing Europe to disintegrate before our eyes, as is America itself as its homeland descends into street chaos. Their stated excuses for this misapplication of muscle are the control of the world’s reserves of hydrocarbons and the containment and eventual dismemberment of China and Russia and the Eurasian union they are forming. Unsurprisingly, neither Russia nor China has elected to take this quietly. Both have resisted. In Russia’s case, following the Maidan revolution in the Ukraine, and seeing their only warm water port in Crimea under threat, they organized a referendum. In an acknowledged free and fair vote some 83% voter turnout chose by 96% to rejoin Crimea to Russia. Here it should be noted that Crimea was part of Russia since Catherine the Great took it from the Turks in 1783. There it remained until Khrushchev, himself a Ukrainian, transferred it to Ukraine, then a part of the USSR, in 1954. In China’s case, they have activated the “nine dash line”, a line demarking their belief of what they consider part of their sovereign nation in the South China Sea. Two points to make here: We are talking about a dispute in the South China Sea, not the East Vietnam Sea and not the West Philippine Sea; and the nine dash line was originally drawn by the Republic of China, now banished to Taiwan, as an eleven dash line. To think that either Russia or China will roll over on this is wishful thinking. It’s also worth noting that this current conflict was predicted by Halford Mackinder in 1904 in a paper on “The Geographical Pivot of History” at the Royal Geographical Society in which he formulated The Heartland Theory. Mackinder is the acknowledged father of modern geopolitical thought. A peaceful demonstration of ethnic Chinese holding Australian and Chinese national flags in the CBD of one of Australia’s biggest (and the fastest-growing) cities, protesting against Australian foreign policy – all of which says a hell of a lot in favour of the country I live in. Cast your mind back a little over a quarter of a century ago, and we had protests in Australia in response to the crackdown and massacre of Chinese citizens by their own government in Tiananmen Square in Beijing. 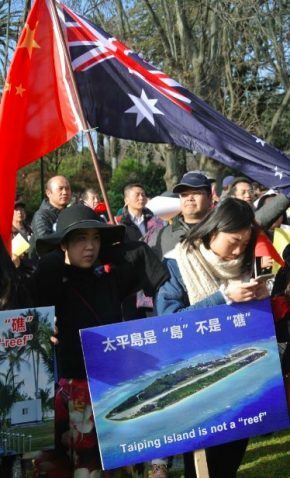 Do you suppose Filipino or Australian nationals living in China now would get away with public demonstrations in support of their own respective governments’ foreign policies over the South China Sea? A few decades ago there were lots of protests, invariably against the Americans, during the era of the arms race between the USA and the Soviet Union. There were two occasions when the world was on the brink of nuclear war. The first of these, the Cuban Missile Crisis of 1962, is well known. The second event is far less familiar, the Soviet nuclear false alarm incident of September 26, 1983, when the Russian’s early warning system sounded the alarm that one to five US Minuteman ICBMs had been launched against them. A Soviet air force officer decided this was a false alarm, thereby averting a major catastrophe (it turned out to be caused by sunlight glinting off clouds that triggered the warning sensors of a Soviet spy satellite). The point here is that it wasn’t the Americans who precipitated these crises; and likewise it is the government of China that has provoked the current controversy in the South China Sea. The government of China has over-reached itself and must bear responsibility for this diplomatic crisis, and the only sensible option is for the Chinese to withdraw. Contemporary history demonstrates clearly that to acquiesce in the face of aggression does not avert the onset of armed conflict.